As announced since January 2018, the old Flash version has been discontinued as it is no longer supported by the old technology. Please start creating your new projects here. Registration is required. You will not be able to access your old projects created in Flash technology, here. WE RECOMMEND: Browsers - Google Chrome and Mozilla Firefox. NOT RECOMMENDED: Browsers - Safari, Internet Explorer/Edge, Opera, etc. Tablets or smart phones. Feel free to TAKE A SURVEY. Your feedback and suggestions are important to us! Customize Geographics® and Royal Brites® paper and display board products for free, in the comfort of your home or office. The new IClicknPrint 2018 is professional, simple and smart. 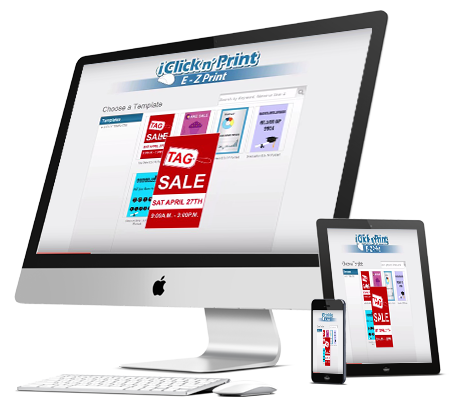 At IClicknPrint, we enable you to create great projects!